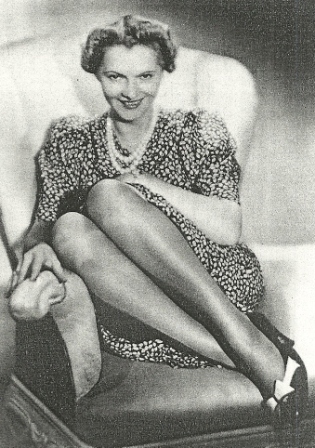 Regular readers of this blog will know that I have been trying to follow the trail of German cabaret singer, Clara Bauerle. Former mistress of German spy, Josef Jakobs, in recent years, Clara has been put forward as a candidate for Bella in the Wych Elm. It's an intriguing theory... mistress of a German spy parachutes into England in the summer of 1941 and ends up stuffed into a hollow elm tree for her troubles. Except for the tiny detail that German music resources indicate Clara Bauerle passed away in Berlin on 16 December 1942. I've been digging away at that date, trying to find something more substantial than online resources. The Bavarian Music Lexicon Online was the original source I found that mentioned Clara's death date, but what was the primary source for that information? A few weeks ago I wrote to the editor of the BMLO and... lo and behold... I got a response. He directed me to the German Theatre Museum in Munich and their annual almanac from 1944. An email to the museum only confirmed that Clara Bauerle was born 27 August 1905 in Ulm and died on 16 December 1942 in Berlin. Nice... but not helpful. I keep hoping that genealogy resources will catch up with my research timeline (births from 1905) but... that hasn't happened. So... a couple of weeks ago, I seized the bull by the horns and requested Clara's birth registration from the Standesamt in Ulm. I figured it was a long shot, given that I didn't know the district in which she was born. Imagine my surprise last week when I received a letter from the Standesamt. Inside was... the birth registration for Hedwig Clara Bauerle, born 27 August, 1905! Clara's parents were Obsthandler (fruit handler) Adolf Bäuerle and Dorothea Barbara Schäufele. This might come in handy if I ever track down her death registration. It might also put me on the track of siblings. Both of Clara's parents were Protestant. The handwriting on the form was a bit sketchy for me so I scanned a high-resolution image to email to my mother, to confirm my translation of the handwriting. As I looked at the scanned image, I noticed a marginal note at the bottom of the form. The gist of the note was that Clara died on 16 December 1942 in a district of Berlin. The note gave the registration and district number for her death registration. It really is amazing to me how blind I can be to things that are right in front of my nose! A quick email to the relevant Standesamt in Berlin yielded the response that death registrations older than 30 years are the purview of the Landesarchiv Berlin. Righto then... a request to the Landesarchiv is in order. Keeping my fingers crossed that in a couple of weeks, I'll finally be able to finally lay Clara Bauerle to rest. what did she die of and i saw this in "mysteries at the museum" travelchannel us. they made no reference to bella of the wych elm or hagley hall but did say she may have been a spy. She died of veronal poisoning. I have a later blog that shows an image of her death registration.